Agricultural extension services are going to be an essential part of rebuilding the Cuban economy after the restoration of democracy. The transition from terribly inefficient and unproductive downwardly-directed mechanisms, now in place, to client-directed, voluntary and open support of agricultural technology poses problems. Especially difficult will be the need to change the mindset of present agricultural scientists in Cuba from the mandating mode now in use, to a service support role; and acculturation of all personnel who have been educated abroad to work effectively within the mores of present day rural Cuba. What will be proposed is a supporting role based upon United States agricultural research and extension methods with emphasis on handling a multitude of diverse crops and the development of grower groups to support applied research for each crop. A pluralistic approach is suggested, in which public endogenous and worldwide agency funded, private non-profit, and for profit organizations would all participate. Resolution of conflict between free individual stakeholders with diverging opinions and interests will be given careful attention. Agricultural extension provides information to support agricultural producers. Most agriculturally significant states of the United States have agricultural extension systems. These systems arose out of cooperation between the Land Grant Colleges and the United States Department of Agriculture (USDA), in a process that started in the U.S. Civil war era and has continued ever since. In the broadest sense, extension is: “customer driven service to agricultural producers, processors, marketers and associated businesses; commodity and resource- oriented groups; and state and federal agencies” (College of Agriculture, 1995). In its narrowest sense, extension provides essential information to run a successful farm or agriculturally related business. The information provided runs from methods of bookkeeping to suggested spray schedules to control disease, planting methods, etc. This information is provided on demand via phone, visits, publications, e-mail, and the internet (web addresses given in References section). Extension responds to farmers’ needs and farmers’ emergencies. However, extension is not just technology transfer but a much wider process in which elucidation of agricultural policy, and development of agricultural leadership, are deployed to enhance agricultural productivity, general prosperity and well being. In this sense, extension has some aspects roughly similar to some of the things the Banco de Fomento Agrícola e Industrial de Cuba (BANFAIC) used to do in the Cuban Republic era (Ferragut, 1995). However, extension does not set policies for agriculture; it acts in an impartial manner, merely providing information and training to all who request it. Since we are from Oregon, we will use this state’s extension service as an example. The Oregon State University (OSU) extension service mission statement is: “We deliver research-based, objective, informal education to help Oregonians solve problems, develop leadership and manage resources wisely.” The Oregon extension service has strong research ties to the Agricultural Experiment Station, the Forest Research Laboratory, and other research and knowledge bases. Since its founding in 1911, OSU extension has grown to have offices and faculty in all 36 Oregon counties. These counties would roughly correspond to Cuban “municipalities.” More than half the OSU extension faculty (extension in the United States is most commonly organized within an academic environment) are located off-campus. There are about 300 faculty (corresponding to 214.5 full time positions, as many extension faculty have other academic duties) and about 200 support staff. The faculty are located in or assigned to ten of OSU’s academic colleges. 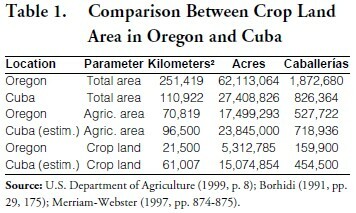 The Oregon extension service helps an area more than twice Cuba’s total land, but with less than half Cuba’s crop land (see Table 1). In addition, Cuba’s cropping period is continual, not seasonal as in Oregon. In Oregon extension, there is extensive networking to communities, state, region, and nation. Some 30,000 volunteers contribute almost 2 million hours each year. These are real volunteer stakeholders who gain and serve through this interaction. This is equivalent to 1,100 full-time employees. To respond to local needs, there is a citizen advisory council for each county and statewide. It is recognized that there will be difficulties in promoting volunteerism in Cuba, given the abuses of this principle and coercion in Cuba. It is likely that, with the exception of returning exiles, there will initially be little support for this part of the program on the island. To connect to the research community, Oregonian extension agents work closely with local, state, and federal research programs. A 36-county planning process shapes statewide programs and priorities. The system provides access to the full educational and research resources of the university. A corresponding program in Cuba might, for example (information taken from Colegio de Ingenieros Agrónomos, 1994; Fors, 1956; Daley 1997; and personal communication 1999), provide input from many areas of the Island. One could envision: coffee growers, reforestation and proposed bioprospecting personnel near Los Números in the Sierra Maestra; tobacco growers near Viñales; cattle ranchers in Camagüey; vegetable growers at Güira de Melena; and citrus growers near Jagüey Grande taking interest in the matter. All this would be linked up to Cuban research sites such as La Quinta de los Molinos in Havana and the agricultural experiment station at Rancho Boyeros, and to various U.S. land-grant colleges. However, since mistrust of the present government is so great, implementation of such a multilinked program in a free Cuba would require great diplomacy, knowledge of Cuban history and local cultures, and considerable interpersonal skills. All this would be worth while since the resulting organization would be an association of free people expressing their opinions and interests and trying to reach consensus on priorities. Yet, the appeal of this approach, if carefully and tactfully implemented, may find surprising support since it would be so very different from the downwardly directed system now so busily destroying Cuba’s agricultural productivity. Given the burden of recent totalitarian history on the psyche of all involved, and especially the grower, it is necessary to make clear extension is a customer-driven service (College of Agricultural Sciences, 1995). And in this changing environment, public relations and psychological factors will be required to let growers know that their information needs will be met. For the system to work, it is important that growers freely express their views and be encouraged to seek advice from extension, private industry, private consultants, international agencies, etc. Groups of growers for each crop could, as they do in Oregon, organize commissions to self tax their products to support the research they need and to get the information they must have in order to be successful and prosperous growers in a free and democratic society. A totalitarian command economy, such as Cuba has now, induces dependency. When this situation changes, it will also be necessary to emphasize that with freedom comes self-reliance. Extension agents must have the proper skills to encourage, in the most tactful but energetic way, the life view that growers and producers have full responsibility for their actions. Extension is not a service to do the farm work for the farmers, growers, producers—it is to help them by providing them with information to better farm, grow and produce. For extension to work, it must be a system where grower inputs and self-responsibility have as large a role as does advice from research and extension agents. For example, outbreaks of new or newly virulent plant disease are facts of life in agriculture in Cuba as elsewhere. Today in Cuba, when this occurs, foreign intervention is blamed (Granma, 1999; Dedaj, 1999), and since nothing can be done about this putative cause, a passive attitude is fostered. The problem of pest and pathogen spread is not new, it pre-dates the founding of the United States. The reason there was a “Boston Tea Party” and not a “Boston Coffee Party” was the spread of coffee rust to Sri Lanka (Ceylon was taken by England in 1797). Sri Lankan coffee planters, their plantations ravaged by the coffee disease, turned to growing tea (Klein, 1979). “Mal de Panamá,” the Cuban or Panamanian disease of bananas, was named Fusarium cubense E.F. Smith (Cook and Otero, 1939). This pathogen now called Fusarium oxysporium cubense (E.F.Sm.) Wr. was discovered by E. F. Smith, the great United States Department of Agriculture plant pathologist (Rodgers, 1952; Campbell, 1981) in Cuban plant material (Smith, 1910; Cook and Otero, 1939). As a result of this disease, major development of a banana industry in Cuba was thwarted, way before the present leader of the Cuban government was born. In a response to pest or pathogen threats, there would be no blaming mysterious planes flying overhead as is done now in Cuba. Free people stand on their own feet: the response must arise from the growers, not from some all powerful government agency. The Cuban growers would band together with each other and with the extension service to support research to defeat the disease. This is what the hazelnut growers of Oregon have done with Eastern Filbert Blight (e.g., Hazelnut Pest Management Guide, 1999; Johnson et al., 1996) or the Northwest U.S. wheat growers with Septoria blights (Baltazar, 1990; Kronstad, 1999). A free Cuba will need extension support for major agronomic crops especially sugar cane and others such as rice. For this purpose new Cuban extension services and private consulting services may well need to seek technology and organizational systems for this in U. S. states with similar agriculture. Thus technologies of extension from states as Florida, California, Hawaii, Louisiana and Texas may well be the wisest choices for these crops. 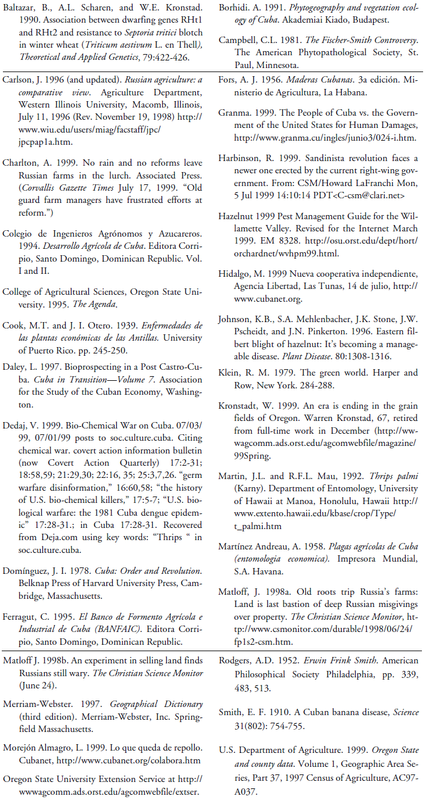 In this matter it is wise also to consider the contribution of Cuban exile agricultural organizations (e.g. Colegio de Ingenieros Agrónomos, 1994; former functionaries of the BANFAIC of the Cuban Republic era, as described by Ferragut, 1995). Older data found in publications from Cuba’s republican era (e.g. Martínez Andreau, 1958) still contain useful information. However, the Oregon State University extension service while only one of many others, is particularly applicable to the Cuban situation. This applicability does not arise from climatic or crop considerations, but because of the great diversity of crops grown in this state parallels the great diversity of minor crops of Cuba’s countryside. Oregon State University Extension Service provides education and information based on timely research to help Oregonians solve problems and develop skills related to youth, family, community, farm, forest, energy, and marine resources. It carries out its mission by extending the research knowledge base of the University to people who need the information, and provides leadership in applying this knowledge to the problems people have identified (Oregon State University). However, since this paper is about Cuba, not Oregon, let us examine the Cuban situation more closely. The two most critical matters developing a workable agricultural extension program in Cuba are funding and psychological cultural interactions. Until Cuban agriculture, once much fought over source of riches, is revived, support for agricultural extension will, by necessity, have to depend on external aid and investment. This of course must be directed towards selfsufficiency as soon as possible. Cuba in most of the last 40 years, concurrently with the destruction of its economy, has depended on exchanges of military sacrifices of its inhabitants in external wars for funding internal programs. All aid must be directed towards founding self-supporting mechanisms. Farmers must be first aided to get on their feet and to acquire a sufficient level of prosperity and agricultural education to support extension programs politically and economically. This of course is major part of the objectives of ASCE and much discussed in previous, present and future meetings of this organization. Thus this matter will not be presented here. The psychological and cultural barriers to a successful agricultural extension program in a future free Cuba are both more subtle and less easy to define, grasp and overcome. Many of these barriers arise because of uncertainty about land ownership. The form land ownership takes in a post Castro Cuba will by necessity form the structures and responses of Agricultural Extension in a free Cuba. Matloff (1998a, b) describes the situation very vividly (see references for some more details); for example Matloff (1998b) states: “Until the national Russian land code comes into effect, people are very cautious. Besides, a lot of people lack the money to buy.” That kind of resistance to private ownership is exemplified by Igor Kudashev, who heads a collective farm in the village of Stari Burasi, an hour’s drive outside Saratov. The farm has increased output mainly by getting rid of 300 workers and hiring experts. But it still is still run pretty much the way it was in Soviet days: by a boss who has ample caviar on his table and lords over workers who hoe by hand and travel in horsedrawn carts.” And in Nicaragua, “One of Mr. Ortega’s (Sandinista) chief aides did not help the pact’s or his party’s image when he said on television that for the Sandinistas, the central goal of the pact was to safeguard the 193 companies and farms the party kept when it gave up power in 1990. Most Nicaraguans remember bitterly what was called the piñata, “the grabbing of properties by the Sandinistas when their revolution failed. The pact is not just the attempt of the Sandinistas, whose popularity continues to decline, to hold on to what they’ve got, critics say, but also part of the Liberals’ “recapitalization” effort after the devastating property losses the party suffered with the Sandinistas’ 1979 revolution” (Harbinson, 1999). One would expect that in a true democracy these individuals would not be successful in establishing a power base. Such land ownership will negate any successful agricultural extension programs. In this case psychological approach, unless very adroit, it not expected to be useful and legislative or even police or military action may be required. Collective groups. It seems that there will be idealistic socialistic groups seeking collective land ownership (e.g. Hidalgo, 1999). However, it is doubtful whether these groups can survive, as such, in a free economy and a free society except when led by exceptional individuals. However, one would expect, that most such attempts would fail through struggles between individuals with different visions. In the resulting “shakedown,” changes in structure are to be expected and these could end up as similar in structure to agricultural commissions that exist in the United States. These groups would make use of agricultural extension and may seek such service. Every way to help these groups through extension should be applied. Individual growers. There surely will be loose associations of small land holders liberated from the structures of land tenure imposed upon them by the present government. These growers certainly will be able to use the information provided by an agricultural extension service. Care will be needed to present the extension as a service not a command. In addition these clients will need to know they are welcome. Legal owners of land. Land in Cuba at present is not held under a rule of law; land use is based upon changing decisions and decrees. The legal owners of the land will seek, and many will succeed, in recovering their lands. Many such legal owners recovered their lands (e.g., as did one of my greatgrandfathers; Mambí Coronel Don Benjamín Ramírez), confiscated by the Spanish, after the Cuban War of Independence. This is a complex group of owners which will include both Cuban and foreign interests. 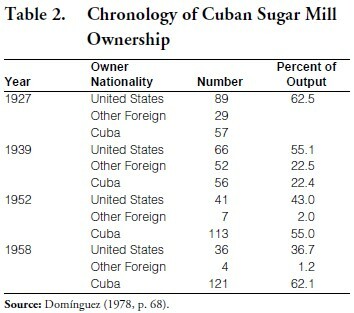 In this regard it is wise to remember that a majority of the holdings in Cuba, before Castro, were held by Cuban nationals, as illustrated by data in Table 2 on sugar mill ownership. Both owners of large and smaller holdings would be clients of the Extension Service. A more traditional U.S. extension-client relationship may be most appropriate here. Extension agent training is going to be one of the more difficult parts of the task. For not only will it be necessary for agents to know the technical details and where to get more information, but the situation will demand a great talent for getting along with all clients of the extension service. Training will also have to take into account the very different back grounds and life views of those who grew up and were trained in agriculture under the present government, of non- Cuban potential agents in the United States, and of Cuban-Americans who want to help. It is not going to be easy. The old stresses derived from overbearing authorities of the present regime will still exist in the minds of many. Leonel Morejón Almagro (1999), president of the Grupo Ecologista Naturpaz, describes the matter as follows: “El delegado ‘elevó’ los planteamientos a todas las instancias, las eternas lamentaciones y las eternas evasivas: ‘Estamos trabajando en eso.’ Toda burocracia es mala, pero la burocracia comunista es de las peores.” Thus, in a free Cuba, choice and training of extension agents must keep this lack of responsiveness of the prior regime and its effect on the growers in mind. Establishment of an Agricultural Extension service in a free and democratic Cuba using models based upon existing state-level systems in the United States is potentially a very promising idea. Problems to be faced include land tenure resolution and especially the psychic scars and false mental barriers from forty years of totalitarian rule. 1. Ray D. Williams, Professor, Department of Horticulture, and William Braunworth, Extension Agriculture Program Coordinator, College of Agricultural Sciences, Oregon State University, Corvallis, Oregon, contributed to this paper. Ray Williams is an extension educator and whole systems inquirer helping Oregonians learn group process and systems thinking to improve the capacity to deal with complex natural resource issues. He has been in Oregon 20 years with previous experience in Africa, Asia, and South America involved with Farming Systems Research & Extension methodologies. William Braunworth, Extension Agriculture Program Coordinator for the State of Oregon, facilitates the budgeting, planning, implementing, and reporting of educational and applied research programs on a statewide basis. He also assists with hiring and promotion of faculty. Statewide Extension agriculture program priorities address critical environmental, production, profitability, policy, and regulatory issues as well as the needs of small farmers and consumer horticulture clients.